East Coast main line operator has launched a 50% off Advance Fares sale valid on its routes between London King’s Cross, the Midlands, Leeds, North East England and Scotland. Bookings must be made by 18th August 2016 for travel between 5th September and 4th November 2016, excluding half term week 21st – 30th October. 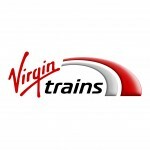 For full details and to book, visit the special sale page at virgintrainseastcoast.com. 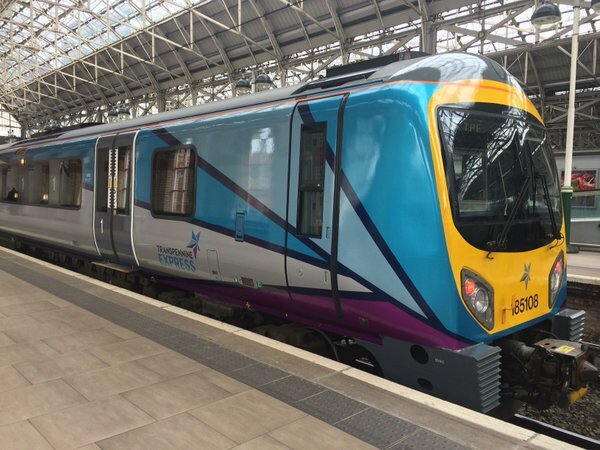 UK rail operator First Transpennine Express has released a flash sale offering an additional 25% off Advance fares across its network. Routes between Edinburgh, Glasgow, Manchester, Liverpool, Leeds, York, Hull, Darlington, Durham and Newcastle are included, for tickets booked by midday on Thursday 5th May 2016 on the TPE website. Tickets must be for travel between Wednesday 4th May and Saturday 23rd July 2016, and railcards can be used with the offer for even bigger discounts. Travel must be wholly on First Transpennine Express operated services, and can only be booked by visiting tpexpress.co.uk/flashsale, where full terms and conditions are also published. Virgin Trains has announced a ‘BIG Spring Seat Sale‘ for travel on its West Coast route between London Euston and Birmingham, Manchester and Glasgow. 800,0o0 seats start from £4 one-way in Standard Class between London and Birmingham, with First Class seats on the route from £17. Tickets must be booked at virgintrains.co.uk or on Virgin West Coast’s app by Midnight on Thursday 3rd March 2016, for travel between 18th March and 2nd May 2016. Tickets are not available through other train operating company or third party websites. Group and railcard discounts are not available, and tickets are non-refundable. Amendments are possible for a £10 fee plus any difference in fare. Child discounts do apply. Heathrow Express, the fast rail link between London’s Paddington Station and Heathrow Airport, is offering members of the British Airways Executive Club complimentary upgrades from Express Class to Business First for a limited period. Departing every 15 minutes, the non-stop journey time is 15 minutes to Heathrow Terminals 1, 2 & 3, with an additional 4 minutes on to Terminal 5. A shuttle service operates between Terminals 1, 2 & 3 and Terminal 4.
Business First Class principally offers larger ‘individual’ seating, with more legroom than Express Class. To take advance of this promotion you must book your Heathrow Express ticket through this page at ba.com. British Airways Executive Club proof of membership is required, along with your ticket for inspection when on board the Heathrow Express. 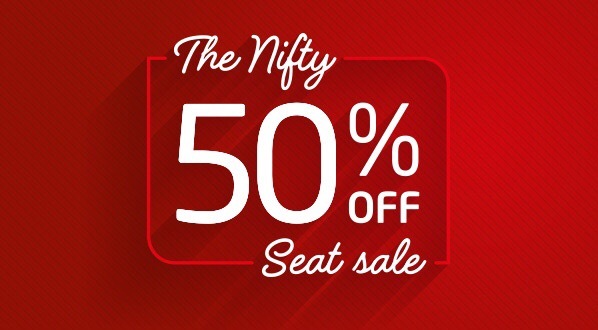 The offer is available to book between 1st August 2014 and 31st August 2014. Travel must be within three months of booking. Tickets are valid for three months from date of transaction. Singles are valid for one journey within three months date of transaction. Return tickets are valid for one calendar month from date of outward journey, within three months of transaction date. To join the British Airways Executive Club free of charge, visit ba.com/executive-club. For full details and to book Heathrow Express tickets, visit ba.com. Passengers travelling between London and Paris, Brussels and Lille can save 10% on fares with a discount code launched today by SNCB Europe, the Belgian National Railways website. The discount is valid for journeys in all three travel classes: Standard, Standard Premier & Business Premier, and for both flexible and non-flexible tickets. The code ‘AAKUAF14FF‘ should be added on the payment page to validate the discount, which may be used 250 times in total. The code offers the greatest opportunity for savings on more expensive tickets, but not only thanks to the gross discount amount increasing proportionally with the fare. Indeed, for the cheapest available tickets departing the UK, it may still be more cost-effective to book direct with Eurostar, especially if booking for one passenger and using a debit card. Belgian Railways charge a flat EUR3 fee whereas there’s no fee for debit card usage on the Eurostar website. SNCB also loads its exUK fares slightly to take into account the Sterling > Euro exchange rate. However, as transactions are completed in Euros, UK cardholders will also face (for the most part) an exchange rate penalty for a second time. Members of the Eurostar Plus Points scheme will not earn points on tickets booked with SNCB. The greater the price of the ticket, the less compromising this is, and the net saving will increase with the fare level when booking with SNCB. However, for journeys originating from Paris, Brussels or Lille, which are presumably priced in Euros to start with, the SNCB code offers a discount on all comparable tickets versus booking with Eurostar direct. 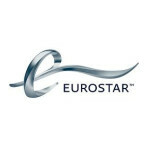 SNCB Eurostar tickets are self-print, and the discount code expires on the 28th February 2014, or when all 250 code applications have been made. 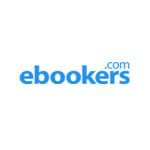 For full details and to book, visit SNCB Europe at b-europe.co.uk. 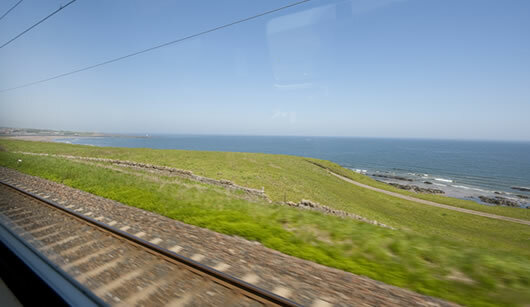 UK long-distance train operator East Coast has launched a sale for members of its East Coast Rewards programme. 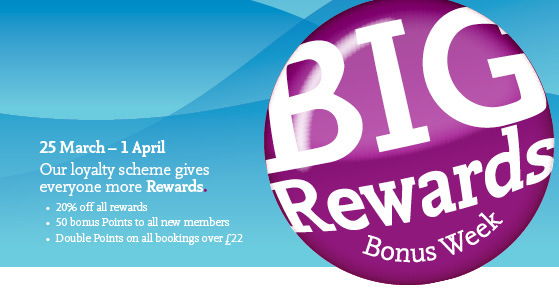 All redemptions have been reduced by 20% until 1st April 2013, and ticket purchases over £22 will earn double points. 24 hours of on-board access is reduced from 50 points to 40 points, a £10 M&S voucher is down from 500 to 400 points, and a one-way First Class ticket on East Coast drops from 450 to 360. East Coast operates from London King’s Cross to stations in the East Midlands, Yorkshire, North East and Eastern and Northern Scotland. East Coast Rewards is a relatively unusual loyalty programme in that it principally rewards bookers rather than just travellers, and members can earn points booking tickets for use on any UK train operator. Although the free East Coast ticket reward is undoubtedly the best overall value for collectors, those bookers who are based away from the East Coast route can still gain some value in redeeming their points for non-travel awards such as wine cases or the aforementioned shopping vouchers. East Coast does not charge a credit card or booking fee, discounts most of its own ‘Advance’ fares by approximately 2%, and ticket on departure from station FastTicket machines is free of charge – as is eTicketing where available. Non-members can also benefit from the birthday promotion by signing up to the programme and earning a bonus 50 points. The East Coast Trains website at eastcoast.co.uk has long been one of the better places to book UK rail tickets, irrespective of train operator. Their own cheapest East Coast advance tickets are sold at a 10% discount to the fare available from station ticket offices, or from any other online retailer. 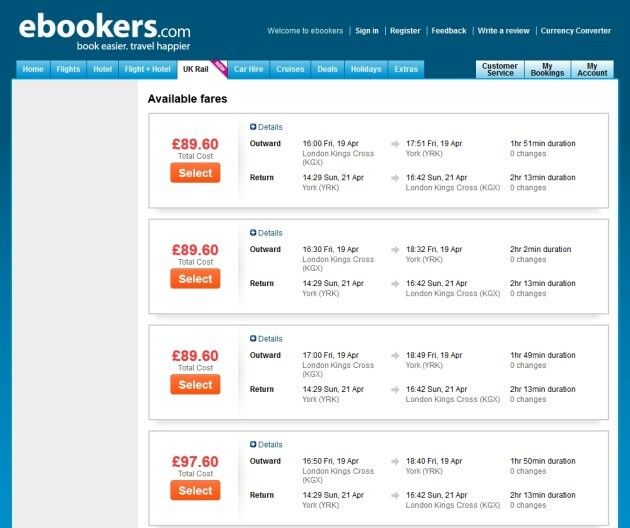 There is no booking fee, no card fee and no fee for collecting tickets from any UK station ‘FastTicket’ machine. Postage to a UK address is a flat £1. 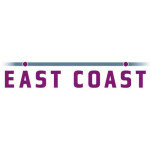 Adding to the benefits of booking through their website, East Coast launched its East Coast Rewards programme in 2011, which uses the same underlying architecture as its forerunners from both National Express and GNER. While the scheme represents one of the most generous reward schemes available to rail ticket buyers, especially those who redeem reward points for free East Coast rail tickets, there have been a few significant frustrations for members. The first is that it has not been possible to check for the availability of free tickets until after a ‘free ticket reward’ has been ordered – a reward which must then be used within 6 months. This met with particular annoyance from former members of GNERtime and National Express escape, who knew that the website system had, in the past, allowed them to search for free tickets before committing points which would otherwise remain valid for 2 years. Secondly, members have not been able to redeem free tickets in exactly the way that East Coast encourages its revenue customers to buy tickets – as singles. So, even if there has been ‘free’ availability in one direction, it has not been possible to redeem at all for that part of the round trip, unless a dummy return has been booked on a random available service, that portion thrown away and a revenue ticket purchased on the required service. The third is that (particularly) business travellers who use a travel agent to make bookings on their behalves have not been able to earn reward points – which has meant that some of East Coast most loyal travellers have not hitherto been able to participate in the loyalty programme. In addition, members booking tickets through selected travel agents will now earn Rewards points through a monthly credit tracked by matching member email address with the address attached to the booking by the agent.